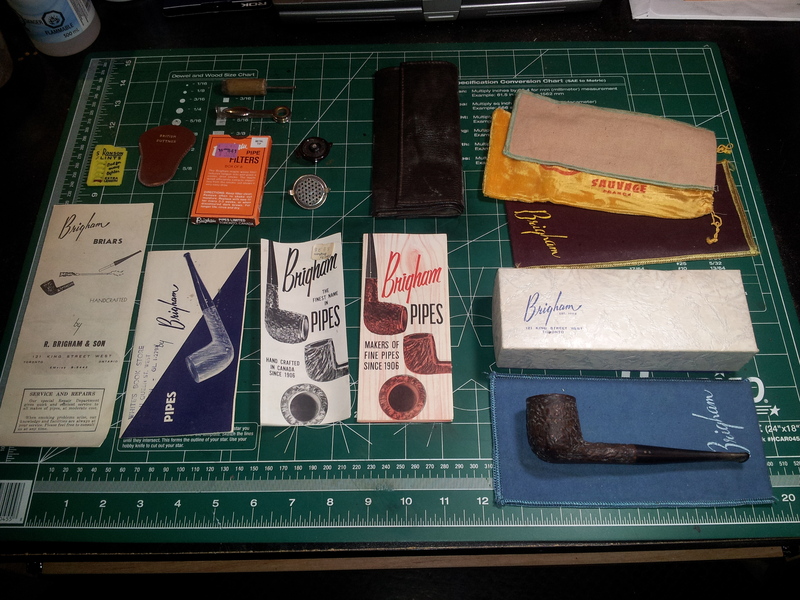 I recently had the opportunity to investigate a small collection of vintage Brigham Pipes advertisements that came to me from one of my brothers, along with one of my dad’s Brigham pipes that my brother wanted me to clean up for him. I wrote about the pipe refurb itself here; in this post I’d like to take a closer look at the Brigham advertising. First a quick pic of the entire contents of the cigar box my brother handed to me with the pipe. As you can see in the pic above, there were four Brigham documents. The leaflet second from the right in the pic came in the pipe box with the pipe. They make for interesting reading in and of themselves, especially to Brigham pipe fans like me, but none were dated. I wondered whether I could establish a rough chronology for the documents based on other factors? I started with a recap of what I knew about Dad’s pipes. My father was born in 1939 and bought his first pipe around 1957 or early 1958 when he was about 18 years old and a member of the Royal Canadian Air Force Reserve. He and my mother (another RCAF reservist) married in 1962, and he died in an accident in 1975. Thus, Dad’s pipe career spanned some 18 years from 1957-75. I figured I could narrow the date window even more using a few bits of data from each pamphlet. There were two leaflets (the two on the left in the pic above) that I thought “looked” older – the print quality, especially of the images, was somewhat crude, and the pipes advertised were drawn, not photographed. In contrast, the images in the other two leaflets were more “hi-res”. The ad copy reinforced my opinion as well – the “older-looking” leaflets made a point of highlighting the patented Brigham Filter System, while the leaflets I thought newer seemed more interested in selling pipes than explaining the filter system, as if the reader was already well aware of the Brigham difference. The clincher for me, however, turned out to be the telephone numbers published in each document. The Brigham company address was the same across the board – 121 King Street West, Toronto – but the phone numbers changed, From “EMpire 8-5442” to the more modern 386-7615. To understand what I was looking at, I did a bit of research into the old Bell Canada telephone exchange system. In 1951, to accommodate growing demand for telephone service, Bell Canada moved from a 2-letter, 4-digit telephone number to a 2-letter, 5-digit system. Thus, the telephone number “EM 8-5442” published in the leaflet “Pipes Handmade by R. Brigham and Son” is a post-1951 number, and indicates that the Brigham phone number ran through the Empire telephone exchange. Similarly, the phone number for White’s Book Store at 11 Queen Street West in Toronto, GL 1-2794, is a post 1951 2-letter, 5-digit number running through the Gladstone exchange. Interestingly, both these exchanges, along with several others, were combined in 1957 into the HOward exchange. So we can assume that both these leaflets were published between 1951 and 1957. The pipes associated with them were most likely purchased by my father in 1957 through to about 1959, after having sat in inventory for a year or two. Looking at the telephone numbers published in the remaining two leaflets, we find that they are the same: 368-7615. Bell announced the phasing in of “all-number dialing” in 1960, and the conversion was complete in Toronto in time for the publication of the 1966 telephone directory, which, for the first time, included no exchange letters in its listings. All this tells us that the last two Brigham leaflets which carry a 7-digit telephone number were printed after the exchange letters were dropped, which could be as early as 1960, but more likely some time about 1964/65. In the mid to late 1970’s, Brigham started printing the year on their leaflets, so consumers could more easily tell what was new in the catalog for that year. Neither of my later pamphlets carry a year dating, so I’m comfortable placing them in the 1965 – 1975 date range. I believe the leaflet found inside the box with my brother’s pipe (third from the left in the pic) dates from the late 60’s or very early 1970’s, as the format of the other post-1965 leaflet closely resembles that of dated Brigham pamphlets from the later 1970’s and early 1980’s. Coincidentally, my twin brother and I were born in 1971, so it’s just possible that this pipe was purchased as a memento of the occasion. I’d like to think so, anyway. The only other clue to the date of this pipe and its accompanying leaflet is the colour of the pipe box. Brigham’s original colours were orange and brown, but this box is blue and silver. Brigham pipes still come in a blue box (actually, now a tin). Unfortunately, I have been unable to determine a date for this packaging change. If anyone has this information and would like to share, I’d love to know. Thanks for taking this trip with me. It was fun to delve into family history, do a bit of sleuthing and pin down a bit more of the Brigham pipe story (their website is sorely lacking in historical information). For the benefit of those with an interest in Brigham’s advertising history, or those trying to date a Brigham pipe in their own collections, I’ve scanned all four Brigham leaflets to PDF format. They are available for download by clicking the links below each image. If you’d like to see more vintage Brigham documents, Bill Tonge and Steve Laug posted THIS batch on RebornPipes a while back. They’ve included lots of great photos of the documents in that collection. Until next time, enjoy your pipes in good health. Some great information from Charles’ site. Have a look. Charles. Thanks for bringing history of your family and our hobby to us. You, Steve and others are warehouses of knowledge. Charles you might contact Brian Levine on Pipes Magazine. He is the Brigham rep in NA. Thanks, Steve! I’ll look him up. I was going to suggest Brian. He was the President of Brigham I believe. Great job on the detective work!